Do Re Mi Fa So La Ti Doooooooooo!!!!! Hey everyone! We have had the awesome experience of reviewing Easy Piano Basics by JazzEdge! Easy Piano Basics, taught by Willie Myette, is a lifetime membership based site where you can download and stream videos that teach you the basics of how to play the piano. You can also print off sheet music for practice. It is tailored to suit those who have no background in piano, and perfect for students who are quite young (I'd say 6 or 7 with a parent's help) to adult. The program consists of 32 short videos, streamed online, that teach the basic foundations of piano technique. The program recommends practicing 10 minutes a day for 5 days a week, but you can always practice more. After all, practice makes perfect! Mr. B has been wanting to take piano lessons for quite some time. The problem is his flavor of autism doesn't lend itself to committed lessons, and we don't have a piano in the home for an instructor to come here. On top of that, the financial strain private lessons would bring is just not something I can do right now. So when we had the chance to review Easy Piano Basics, I was pretty excited. Since neither of us have every taken a piano lesson, I really have no measuring stick in that sense. So please keep that in mind through this review. 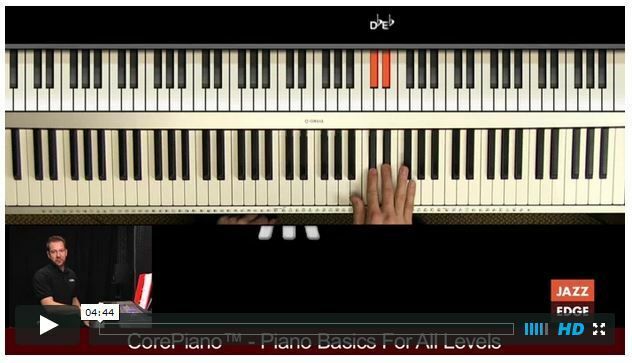 Easy Piano Basics is a really nice online program to learn exactly what it says, piano basics. It seems to me as if it is foundation material that anyone would need to learn before progressing on to a more advanced program (also offered by JazzEdge.) You're first lesson starts with the basics of learning which keys are which, and each lessons builds upon the ones before it. The nice thing is you are able to replay the videos as many times as you need. The downside, you are repeating the same video over and over. Of course the material is built upon, so it's reviewed elsewhere....but not the same as the first lesson. This format is nice so that you can have your lesson anywhere you have an internet connection. You just need a 61 key keyboard, no need for a full piano, and it's a one time fee. The lessons are really short. The videos aren't very long, only a couple of minutes each. And each lesson instructs you on what to practice each week. This is good if you don't have a lot of time, or you have a lot of other obligations and are unable to devote a lot of time, or add another obligation to your already busy schedule. This was good for us since Mr. B needs a lot of repetition and I was able to extend the lessons beyond a week if needed (and it was always needed.) Most of the time we would watch the video and keep practicing for much longer than 1 week. Lesson one, for example, was nearly 3 weeks for us. We are still working on our finger numbers. The downside ( a matter of perspective) though, is that there's not a lot of practice, unless your student is disciplined or you are. A 3 minute video isn't a long duration. And 10 minutes a day, 5 days a week, isn't really much time. I was always under the impression most piano lessons were at least an hour with daily practice on top of that. I wish there were more videos for each lesson, with more practice involved. With that said, the videos are awesome because you get a very nice visual of the keyboard so you can SEE where your hands should be. You can also hear him talking, hear him playing, and see him in the corner of the video. So that is really good. The GREAT thing about Easy Piano Basics is that your payment is a lifetime membership. So if you have more than one child, or you wish to use it yourself, you can easily log back in and start anywhere you wish, anytime you want. If you have a more advanced student, but you need a little refresher, then this is a cost efficient and fantastic tool to use for that. With a little patience, and a tolerance for repetition, this is suitable for special needs. But you may have to repeat the same videos more than a couple of times to get the concept down. Overall: For us, this just wasn't a good fit for Mr. B, but I rather enjoyed it. BUT our special needs played a huge role in that. Also, I could have been more structured and set aside a specific practice time each day, instead of working it in at different times. Now that summer is upon us, I think we will start back from the beginning again and dedicate more time each day and see if Mr. B does better. I have learned a lot, and the refresher from the music reading standpoint was nice. The sheet music is easy, and you learn to read music as you progress through the videos and the music. I would love to see a special needs minded program along the same lines, but I don't know enough about piano basics to even suggest a starting point there. Longer videos or more videos dedicated to the same topic, more practice broken down into smaller parts, perhaps. That would be fantastic and beneficial on a number of levels. Another suggestion I have is to integrate all of the programs into a single website. I always bookmark any online program sites, but if I'm not on my laptop I can't access those bookmarks. JazzEdge has various products, and each has a different and unique web address that can't be accessed via JazzEdge easily. So I think a GREAT upgrade would be a user friendly website where one could easily access any of these great programs from the same webpage. That way, scatter brains like me aren't lost. If you would like to check out more fantastic reviews on this product, and others, please check out the Review Crew! Just click this banner!